The priority in Directories continues to be the introduction of new products. 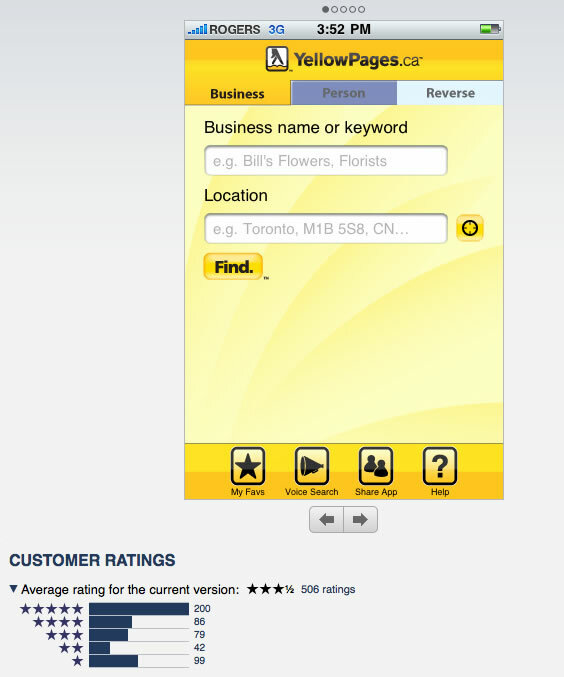 During the quarter, YPG launched a new version of its popular YellowPages.ca™ local search application for the Apple iPhone. The latest version features advertiser video content and continues to put the power of Yellowpages.ca in the hands of on-the-go users. The YellowPages.ca™ mobile application remains in the leading free downloaded apps since launching at the iTunes App Store. To date, the company reports over 500,000 downloads of the iPhone and Blackberry® apps. I originally posted about Canada’s First Integrated Business and People Search App back in April 2009. 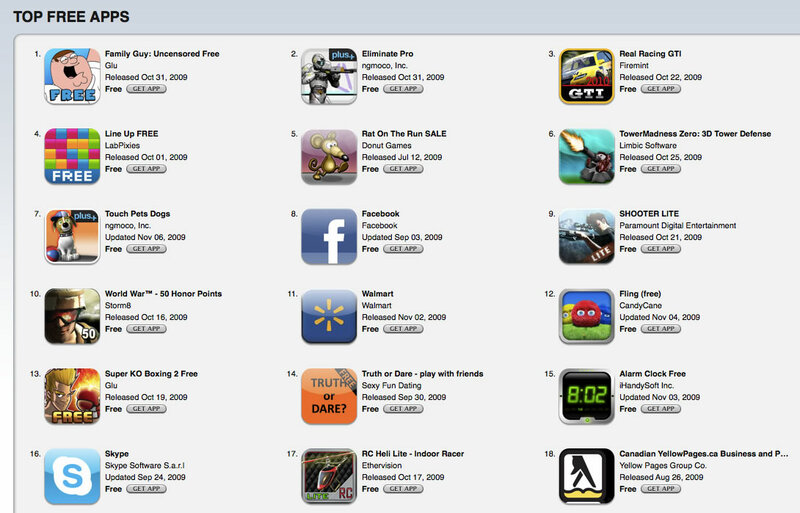 At that time, the application was #7 most popular free application within the first week. Note: many of the 1-star ratings are from a competitor of this app who have decided to use multiple user names to say negative things and promote their own application. Personally, I think it’s a pathetic marketing strategy that consists of flaming a ratings/reviews engine, but to each their own. There are some legitimate users who have bashed this application and I can assure you that YPG reads your comments and will act accordingly. This application has a boat load of content including up-to-date business and people information, tens of thousands of videos and hundreds of thousands of pieces of enhanced content like hours of operations, payment types, etc. There is more content coming, but as a starting point, there is no other application in Canada that boosts such an impressive array of local content. There has only been 2 iterations of this application since its launch. The second version of adding video was a very common user request and YPG is working on some new features that users are asking for. Stay Tuned. Why is this significant. Many local applications release half-baked features (mostly in the hopes of getting some PR value) that either don’t work, work sporadically, have limited usability on a mobile platform, or simply don’t have enough content to be functional. The YellowPages.ca application is a highly efficient app that delivers value by giving user what they want and when they need it. It delivers on a simple promise to connect buyers and sellers and this seems to resonant with Canadian mobile users. Sometimes simplicity can actually be the most efficient user experience. What are you thoughts on the local mobile space? Will “cool” beat “functional”? Like the web, is content the king on mobile as well? What features would you like to see on a local application? This entry was posted in iphone, YellowPages.ca and tagged blackberry, iphone, itunes, Mobile, people search, YellowPages.ca on November 8, 2009 by Darby Sieben.